We've all been faced with the dilemma: to get customers to pay promptly without offending them. When a bill is not paid within the agreed-upon time, send another statement with #ST-PD "Past Due-Wrong Pile" on it. If your customer knows that you've not forgotten about the unpaid bill, they are less likely to put it aside and delay payment. After sending multiple statements, use #ST-NAG "We Hate to Nag". 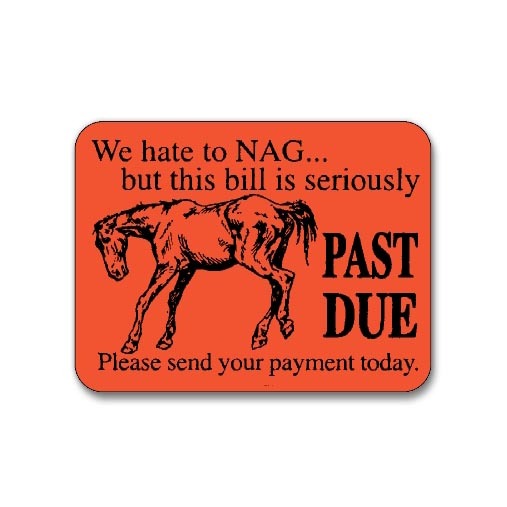 Hopefully, by this time your bill will have advanced to the top of the "to pay" list and this more forceful reminder will result in receipt of payment!